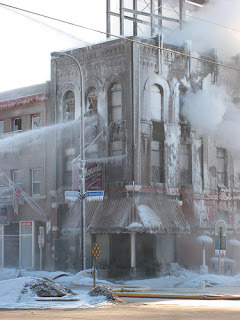 That is what happens when a burning building is doused with water in subzero weather. Maxwell’s a great 12 table bar – I worked there in college. Home to the greatest wings in Mpls. Looks like it will be a while before Mary can make me one of her famous bloody marys. This entry was posted in Uncategorized on February 20, 2008 by Jennie.